A great deal of variability exists in the Down syndrome population in terms of their motor control, coordination, and skill. Virtually all papers on motor control, motor development, and motor learning in Down syndrome mention low muscle tone or hypotonia as a major contributor to the typical differences between movements performed by individuals with and without Down syndrome. Our paper makes an effort to discuss what is currently known about hypotonia, motor skill development, and physical activity in Down syndrome. There is a critical need for more objective measures of muscle tone or stiffness and the design and testing of interdisciplinary interventions to maximize physical activity, health, and community participation in the Down syndrome population. Considerable variability exists among individuals with Down syndrome with regard to the degree of disability and the specific features affected. Greater joint range of motion, presumably attributable to ligamentous laxity, delayed development of postural reactions and myelination, low muscle tone, and congenital heart defects, have been hypothesised as major contributors to delayed motor skill development. In this paper, we will discuss potential causes for hypotonia in individuals with Down syndrome, why the development of motor skills are important in young children, adolescents, and adults with Down syndrome, what is known about physical activity levels in Down syndrome and the importance to health and movement skill development. Persons interested in a good overview of what is generally known about motor development and Down syndrome are encouraged to access the work by Sacks and Buckley, Palisano et al., Jobling and Mon-Williams, Block, and Henderson[5-9]. "In sum, the role of hypotonia in accounting for movement disorders in individuals with Down syndrome can no longer be considered a default explanation when all alternatives fail[15: p.392]". An examiner moves a joint of a person smoothly and slowly, while the person is instructed to relax and not to resist the motion. The examiner compares the feeling of resistance to his or her 'internal gauge' based on previous experience - what he or she associates with being 'normal' - and lower than expected resistance is called 'hypotonia'. This operational definition, although suboptimal (since it relies on a subjective feeling of the examiner), allows to identify a few potential contributors to muscle tone. These contributors reflect a number of factors that may affect the resistance an examiner feels when he or she tries to move a limb segment of another person. Assuming that a person is relaxed completely, and during the examination muscle activation levels show no deviations from zero, joint resistance will be defined primarily by the mechanics of peripheral tissues. In a first approximation, resistance to an external motion gets contribution from inertia, elasticity (resistance to stretch), and damping (resistance to velocity). In particular, human tendons and ligaments provide for a non-linear viscoelastic behavior of passive joints, while relaxed muscle fibers show relatively low resistance to stretch[18,19]. If joint motion is performed quickly, the inertial resistance also cannot be ignored. The following factors can potentially lead to lower resistance to externally applied motion in persons with Down syndrome. Laxity of ligaments, lower inertia of the body segments (in particular, they are shorter), and more compliant tendons. The first two factors may be viewed as well-documented[20,21]. The shorter limbs of persons with Down syndrome allow to expect significantly smaller moment of inertia. In fact, a 20% shorter limb segment (assuming proportional scaling of all its dimensions) provides less than half of the inertial resistance to motion given the same angular acceleration. This ability cannot be taken for granted. In some cases, such as spasticity, people cannot relax muscles at certain joint configurations, while under emotional stress, or when their body parts move (reviewed in Dietz). Even a typical, healthy person may need explanation and time to be able to relax when his/her limb segments are manipulated by another person. It is common knowledge that some people are able to relax 'completely' during massage or other manipulations while others cannot or, at least, require reminders and time to relax. It is theoretically possible that persons with Down syndrome can relax quicker and more completely than persons without Down syndrome. If so, this contributor to hypotonia reflects their BETTER control of muscles! Unfortunately, recording minimal muscle activation during incomplete relaxation is very difficult. However, this is not impossible, and we would not be surprised if residual muscle activation levels prove to be higher in persons without Down syndrome as compared to those with Down syndrome. Typically, researchers assume that participants in experimental studies and clinical examinations do not react voluntarily unless they are instructed to do so. However, persons without Down syndrome may show a creeping change in their 'relaxed' muscles towards higher activation (or closer to the threshold of activation) with joint motion, particularly if the test lasts for some time. Persons with Down syndrome typically show less initiative and may be more compliant with the instruction to relax and stay relaxed over the examination time. We assume that the motion produced by the examiner is smooth and not very fast. As such, it is not expected to produce monosynaptic reflexes or long-latency pre-programd reactions (also known as M2-3, reviewed in Chan and Kearney; McKinley et al.) in the stretched muscles. Involuntary muscle activation during not very quick joint motion can be seen if the threshold for muscle activation is reached during the motion (Figure 1). Muscles with zero activation can be deeply relaxed (their activation threshold is very far, possibly beyond the anatomical range of joint motion) or superficially relaxed (their activation threshold is close and can be easily reached if the muscle is stretched). Note that a similar explanation has been offered for involuntary muscle activation in spasticity[25,26]. If joint motion leads to muscle activation, the viscoelastic properties of muscle fibers take over the contribution of the tendons and ligaments to joint resistance to motion and define this resistance[27,28,29]. Figure 1 | Two force-length dependences are shown on the force-length (F-L) plane. 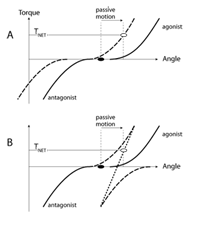 In the initial position (the black dot), muscle length is shorter than the threshold for muscle activation corresponding to either curve. The muscle is completely relaxed. A passive motion stretching the muscle (the arrow) may lead to different levels of muscle activation and different active muscle forces depending on the actual location of the force-length muscle relation. Curve-1 corresponds to a "less relaxed" muscle as compared to curve-2. These considerations allow us to offer the following hypothesis: Persons without Down syndrome typically are ready to produce corrective actions in situations of unexpected events in the environment. Hence, even when they seemingly relax muscles completely (there is no visible electrical muscle activity), muscle activation thresholds are never too far and can be easily reached with passive joint motion (as illustrated by curve-1 in Figure 1). Persons with Down syndrome are known for their slower reactions to virtually any stimuli. This may be partly due to their deeper relaxation, such that it takes more time to bring muscles to activation thresholds (illustrated by curve-2 in Figure 1). The deeper relaxation is reflected in smaller active muscle force (and smaller muscle activation) during passive joint motion (compare the final points P1 and P2 in Figure 1) and, respectively, to lower resistance to joint motion. There are two basic types of muscle reaction to joint motion, reciprocal and co-activation. The reciprocal pattern leads to activation of the stretched muscle without activating the shortened one. Figure 2A illustrates muscle torque-angle characteristics for a pair of muscles opposing each other (an agonist-antagonist pair). Note that the antagonist muscle produces negative torque. Both muscles are relaxed in the initial joint position, that is the active torque produced by each muscle is zero. If in response to joint motion the characteristics move in the same direction (reciprocal shift, see ref 30) to counteract the imposed action, the stretched muscle becomes likely to show non-zero activation, while the shortened muscle remains quiescent. An alternative, co-activation pattern is illustrated in Figure 2B. Joint motion leads to shifts of the two torque-angle characteristics in opposite directions such that both muscles may be expected to show a non-zero activation level. Note that if one assumes similar magnitudes of the shifts of the characteristics, the net resistance in the case of the reciprocal pattern (net torque, TNET) is expected to be higher than in the co-activation case. Figure 2 | Originally, both muscles acting at a joint are relaxed (black dot). In response to passive motion, in panel A the muscle torque-angle curves shift in the same angular direction (recipricol shift). In panel B, the two curves shift in opposite directions (co-activation shift). As a result, the net active joint torque is higher in A than in B (open circles). Persons with Down syndrome are known to show co-activation patterns in many tests where persons without Down syndrome show reciprocal patterns. Such patterns have been shown during voluntary movements, during anticipatory postural adjustments, and during reactions to perturbations of limb joints and of vertical posture[31,32,33]. Figure 2 suggests that reciprocal activation of the agonist-antagonist muscle pair is expected to create a larger resistance to motion as compared to that produced by a co-activation pattern. So, somewhat counter-intuitively, preference for co-activation patterns in Down syndrome may be a contributor to hypotonia! Another factor that may distinguish between persons with and without Down syndrome is the slope of the relation between muscle length and active muscle force. However, available data suggest that the slope of muscle and joint characteristics is not changed in persons with Down syndrome[34,35]. This conclusion is also supported by a study of postural responses to unexpected platform displacements, which led the authors to conclude that Down syndrome is associated with a basically intact segmental spinal apparatus. iii) use EMG to monitor involuntary muscle activation or level of voluntary reciprocal/co-activation. In addition, ratings of tonus may be influenced by perception of muscle strength and joint range of motion. Sanger noted that muscle weakness may coexist with hypotonia - but muscle weakness may be the biggest contributor to the observed patterns of everyday movements. Unsurprisingly therefore, typical subjective clinical assessments demonstrate poor ability to discriminate tone at the lower ends of the scale, weak inter-observer agreement and inconsistencies in the characterisation of tone in infants. Reliable, objective methods are required to substantiate hypotonia in Down syndrome and to subsequently examine the relation between tone and motor development. It is also proposed that definitions of hypotonia differentiate between passive properties of a joint (inertia and viscoelastic soft tissue properties), intrinsic muscle activation/co-ordination patterns and involuntary muscle activation. This will aid the understanding of the neurophysiological basis of hypotonia. The ability to assess and compare connective tissue properties of individuals with and without Down syndrome will enable further insight into key determinants of motor development. It may also enable the development of more sensitive methods of clinical assessment. Relatively little is known about the development of muscle elastic development with age and maturation in typically developing children. This may reflect the relatively recent development of methods allowing noninvasive in vivo measurements. To develop a more objective measure of 'hypotonia' in children with Down syndrome, it is useful to revisit our initial definition regarding current clinical assessment: An examiner moves a joint of a person smoothly and slowly, while the person is instructed to relax and not to resist the motion. The examiner compares the feeling of resistance to his or her 'internal gauge' based on previous experience - what he or she associated with being 'normal' - and lower than expected resistance is called 'hypotonia'. This reflects the perception of 'passive resistance to motion' - resistance observed when the relaxed musculotendinous structures are stretched throughout a specified joint range of motion. It may be considered to represent a simplified measure of 'stiffness' which is the ratio of stress (force per unit cross-sectional area of the material) to strain (change in length relative to original length) - characterising the deformation of a material under load. Due to the difficulty of measuring the cross-sectional area and fiber length of biological tissues in vivo, the ratio of the force or torque resisting motion to joint angular displacement (assessed using dynamometry and EMG) can be used as a simpler representation of stiffness. Considering the factors that are known to influence muscle tone/stiffness (inertia and viscoelastic soft tissue properties, intrinsic muscle activation/co-ordination patterns and involuntary activation, the examination of stiffness in infants is complicated by ethical issues and subject compliance. Maximal muscle actions cannot be electrically evoked prior to perturbation of the joint to separate the contribution from reflexive and non-reflexive stiffness components. Neither can the infants be instructed to voluntarily maintain a fixed torque during perturbation. Therefore, as a start point, it may be prudent to objectively examine the passive stiffness of muscle groups (confirmed by EMG) during joint movement. Eliminating intrinsic muscle and reflex activation contributions, the objective measurement of passive resistance to motion will allow muscle and connective tissue material properties during stretch to be examined. As previously stated this would require the degree and velocity of stretch to be controlled. Surprisingly this does not appear to have been studied in children with Down syndrome, even though protocols for assessing passive resistance to motion have been described in the literature[41,42,43]. An extension of the objective assessment of passive resistance to motion in children would be to estimate muscle/tendon cross-sectional area and fiber length data in vivo to allow more reliable stiffness values to be derived. Techniques for assessing contractile and/or tendon length and muscle cross-sectional area in vivo include: sonomicrometry, magnetic resonance imaging (real-time and cine phase contrast), X-ray scanning and ultrasound . Of these methods, ultrasound has gained popularity due to being non-invasive, more affordable, portable and may be less time consuming; its ability to be used during passive resistance to motion assessment (measurements are not constrained to the confines of a scanner), and due to improvements in musculotendinous visualisation and tracking. Therefore in addition to passive resistance to motion tests, the measurement of musculotendinous properties and response to stretch would aid the interpretation of variation within and between individuals (since differences in muscle/tendon cross-sectional area and elongation during stretch can be considered). These analyses will enable 'hypotonia' to be examined more reliably, and quantitative data will assist examination of links to motor performance making intervention strategies more reasonable to test. Muscle structural properties and neural activation influence the development of mature postural reactions and movement performance[2,46,47]. A critical level of musculotendinous stiffness/tone is necessary for contractile forces to be transmitted to the skeleton. The rate of force or torque development (indicative of the ability to perform explosive muscle actions) has also been correlated with in vivo estimates of connective tissue stiffness. Despite this research, further studies are required to examine the role of tone/stiffness in the motor development of children with Down syndrome. Aside from the consideration of how to objectively assess muscle tone, methods of assessing skill performance should also be briefly evaluated. The walking development of infants with Down syndrome has frequently been compared to typically developing infants to aid understanding of motor delay. Sutherland et al. identified five determinants of mature gait: duration of single limb stance, walking velocity, cadence, step length and ratio of pelvic span to ankle spread. Step length/limb length was also suggested to be an important marker of neuromuscular maturation. Several kinematic differences between individuals with and without Down syndrome have been noted which may contribute to the delayed development of walking in children with Down syndrome. Rast and Harris noted less ability to control anti-gravity movements of the lower extremity and difficulties in adjusting head position in space in individuals with Down syndome. Pelvic and hip instability, particularly excessive degrees of thigh abduction have also been documented. This may limit stepping ability, since the position of the hip is important for load reduction at the end of stance and for swing initiation. Also reduced plantarflexion moment of force and power generation in 8-36 year old individuals with Down syndrome have been found suggesting 'hypofunctioning' of the ankle. This would limit step length and possibly lead to a relative prolongation of the stance phase of the gait cycle. These kinematic and kinetic differences may suggest deficits in the strength and postural control (which may or may not be influenced by muscle tone) required for the demonstration of mature gait patterns. It is important to emphasize that few studies have actually quantified (using biomechanical analyses), limb kinematics and/or kinetics during walking development in Down syndrome. Typically developing children demonstrate a wider base of support, reduced stride length and average walking speed, a relatively flat-footed foot contact, minimal knee flexion during the stance phase, externally rotated lower limbs during the swing phase and a lack or reciprocal arm swing compared to adult gait patterns. However Ganley and Powers recently noted that the actual differences between child and adult gait, and the age at which children achieve a mature adult-like gait are yet to be described. This may reflect failure to consider factors controlling the acquisition of gait (and therefore intra-/inter-individual variability) during data analysis. Thus comparison of the development of gait in children with Down syndrome to 'typically' developing children is difficult. Anthropometric characteristics (body size, limb proportions) may contribute to the explanation of gait variation in children and adults. Ganley and Powers compared gait sagittal plane kinematics and kinetics of 7 year old (typically developing) children to adults using age-specific anthropometric data (collected using dual X-ray absorptiometry). Joint kinematics did not significantly differ at the hip, knee or ankle between the children or adults, however peak plantarflexor moments of force and peak power absorption and generation were significantly lower at the ankle. It is interesting to note that Cionni et al. interpreted the reduced plantarflexion moments of force and power in 8-36 year old individuals with Down syndrome as suggesting 'hypofunctioning' of the ankle - even though (according to Ganley and Powers) this may reflect typical gait development in children. In addition, despite the wide age range in the study by Cionni et al., only 17 participants with Down syndrome were examined. There is a need to consider anthropometry when comparing gait characteristics (particularly given the recognised differences between children and adults with Down syndrome and typically developing children and adults). Further biomechanical studies are warranted to enable atypical gait to be differentiated in individuals with Down syndrome and subsequently the identification of contributing factors. The previous discussion of walking development in children highlights other limitations of Down syndrome motor development research. The majority of studies document the age at which specific motor milestones are achieved, as opposed to the actual process of achieving these milestones. As in walking, it is important to identify whether motor development is simply delayed (with typical movement patterns displayed), or whether the movement patterns used to achieve the milestone are atypical. One of the most widely used scales to assess infant motor development - the Bayley scales of infant development, only enables a pass/fail distinction, without judgement of the kinematics and kinetics of performance. In summary, there is a need to re-examine hypotonia in infants with Down syndrome and the proposed relationship to motor delay and impairment. This requires more objective assessments to be undertaken. It is proposed that future studies should explore protocols based on dynamometry (for the measurement of passive resistance to motion) along with ultrasound techniques. More sophisticated biomechanical analyses are also needed to assess children's motor development adjusting for inter-individual differences in physical characteristics. H1: Tone does not significantly differ between individuals with Down syndrome and typically developing individuals. H2: Individuals with Down syndrome have more compliant tendons and ligaments and lower inertia of limb segments. H3: Individuals with Down syndrome have a better ability to relax muscles completely and stay relaxed over the examination period compared to persons without Down syndrome. H4: Individuals with Down syndrome display deeper muscle relaxation (the muscles are farther away from muscle activation thresholds) compared to persons without Down syndrome. H5: Individuals with Down syndrome demonstrate a preference for co-activation patterns in contrast to reciprocal activation patterns displayed by persons without Down syndrome. H1: This hypothesis cannot be rejected until more objective assessments of 'tone' or stiffness (considering confounding factors) are implemented. H2: Laxity of ligaments and lower inertia of body segments may be viewed as proven. Studies should record appropriate anthropometric measurements to aid explanation of variation in musculotendinous and performance characteristics. Ultrasound techniques can be used to assess the relative stiffness of muscle and tendon structures. The question of how much the mechanical characteristics of peripheral structures in persons with Down syndrome contribute to hypotonia can then be addressed. This requires quantitative analysis of the other hypotheses. H3: This hypothesis is likely to be very hard to study because its testing requires reliable recording and quantitative analysis of very small electromyographic (EMG) signals. Such a study may require using arrays of EMG electrodes to be able to pick up small signals in any portion of the studied muscles. H4: Can be studied with controlled joint motion (different amplitudes and velocities) under an instruction "relax the joint and forget about it". Another approach would be to apply a controlled mechanical perturbation (slow and smooth!) from a state when both muscles show minimal, non-zero voluntary activation, for example 2% of maximal EMG signal. Such an approach would also test the slope of the force-length relation for the muscles. H5: The hypothesis on the preference of co-activation patterns in Down syndrome may be viewed as partly proven. It may be further studied using controlled externally imposed cyclic joint motion. Acquiring the ability to locomote is important to infants because of the impact on cognitive and social/emotional skills, as well as for the more obvious relevance to subsequent motor skill development. At the cognitive level, researchers have demonstrated that for typically developing infants, experience with locomotion accounts for the onset of a broad array of psychological skills. They include: the onset of wariness of heights, the concept of object permanence (that objects hidden from sight may still exist), a shift from self-centerd to landmark-based spatial coding strategies, the ability to follow the pointing gestures and gaze of another person, aspects of social referencing, and detour reaching[57-61]. These data suggest that infants learn more about spatial cognition and the world around them as they become able to locomote independently and can actively explore their environment than through passive observation, i.e., being held or carried through space. Rosenbloom further suggests that not only is locomotion important but the quality of movement also effects subsequent development. He proposes that inefficient locomotion may inhibit development by limiting the attention and energy infants can focus on exploring stimuli in their environment. Acquiring stable motor skills may be especially important for the cognitive development of infants with Down syndrome. In our society delays in motor development are often tacitly equated with delays in cognitive development. Such assumptions may foster lower expectations from caregivers and thus exacerbate their inherent delays. The onset of the ability to walk alone represents an important milestone for both infants and their parents, for social and emotional reasons. Clinicians have described the onset of walking as a time of elation, exhilaration, and delight, as well as of affective reorganisation and wilful autonomy[63,64,65]. Parents of infants with Down syndrome report that walking is one of the goals they value most for their young children. Family and friends repeatedly ask them if their child has yet begun to walk and talk, a disconcerting question, as the delays become longer. These are behaviors that are apparently universally accepted as important. When infants finally walk on there own parents are relieved and reassured by this quite tangible evidence that progress is indeed being made. Jones, Liggon and Biringen documented that, following walking onset, typically developing infants demonstrated greater independence (moved away from mother more frequently than when they could only crawl) and showed an increase in positive affect during play. Interestingly, parents in the Jones et al. study indicated that they did not notice the impact on their children's affect but consistently observed that their child was more independent and physically active. For parents of children with Down syndrome the importance of their child's increasing independence was illustrated in a study conducted by Sloper and colleagues. They studied factors that impacted on the stress levels and satisfaction with life of 123 families of children with Down syndrome. For mothers, the primary caregivers, stress level was strongly related to their child's self-sufficiency. When children with a disability can walk alone, handling and physically caring for them becomes easier for their parents. Treatments are therefore recommended to start early so that the child may achieve optimal development. In the motor domain, stable and efficient locomotor skills form the foundation for developing more complex motor skills. Children use these skills to interact with other children in games and activities. In school and neighborhood settings, children with poor motor skills are often excluded from, or, choose to avoid physical activity. A longitudinal study of children with Down syndrome from ages 1 month through to 6 years who had been enrolled in early intervention programs in Canada was conducted for the purpose of developing motor growth curves. Based on the results of the growth curves, the researchers concluded that children with Down syndrome require considerably more time to acquire early motor behaviors. For example, they predicted that at 24 months of age only 40% of the children with Down syndrome would demonstrate the ability to walk across the room and at 5 years of age only 45% would display the ability to run. Anecdotal observations of children with Down syndrome suggest that they tend to fall more often than their typically developing age peers although no systematic study has verified these informal observations. A recent study by Virji-Babul and Brown sheds some light on the issue of walking and negotiating obstacles in children with Down syndrome. Their findings suggest that children with Down syndrome have adopted one strategy of negotiating obstacles at different heights and they do not appear to use anticipatory adjustments as they are approaching the elevated obstacle like typically developing walkers. The strategy used is to walk up to the obstacle and stop and then extract the necessary information needed to step over the obstacle safely. Their unwillingness to explore alternative strategies in this functional task is in line with their primary goal of remaining safe as they move in their environment and their inability to use advance visual information as they move. Based on the accumulation of research on the acquisition of early motor behaviors in Down syndrome, one has to conclude that researchers and clinicians have not been successful in meaningfully reducing the delay in onset of critical locomotor behaviors and improving performance. One intervention approach, treadmill training, has consistently demonstrated positive outcomes in reducing the age of onset of many locomotor milestones[65,70]. Treadmill training of infants with Down syndrome is founded on the theory of neuronal group selection (NGS)[71,72] and principles of dynamic systems theory (DST) applied to motor and cognitive development[20,73,74]. 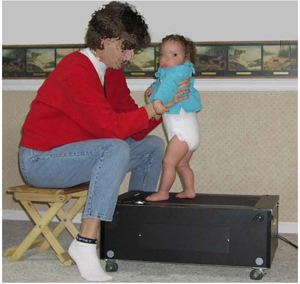 Being supported on a small infant sized treadmill by the parent (see Figure 3), long before independent walking emerges, affords the infant with skill specific practice using the alternating stepping pattern employed later in independent walking. It was hypothesised that the experience resulting from stepping practice over a longitudinal period strengthens and stabilises the synaptic connections among motor neurons (neuronal groups) that drive the stepping pattern. By providing the infant with frequent opportunities implemented in the home to explore multiple leg coordination patterns in an upright posture, promotes earlier selection of alternation as the preferred leg coordination pattern. The treadmill stepping practice also advances critical subsystems needed to walk: leg extensor strength and postural control. Treadmill training increases leg strength needed to support their body weight during walking, and promotes specific postural control mechanisms that are needed to maintain upright balance as the infant transfers their weight from one leg to the other. The treadmill intervention initiated by 10-11 months of age takes advantage of a period of maximum neural plasticity and meets Latash's recommendation of encouraging the infant with Down syndrome to engage in early exploratory activity to facilitate the discovery of general rules of motor coordination. The results of two randomized intervention studies employing the treadmill intervention as a supplement to physical therapy with infants who have Down syndrome have clearly demonstrated that the intervention significantly increases alternating stepping and reduces the age of onset of independent walking and other pre-walking locomotor behaviors. The intervention has not produced obvious harmful effects and may have additional positive outcomes related to gait and physical activity[65,70]. More interventions, based on principles on NGS and DST, are needed for important functional movement behaviors for children with Down syndrome and other disabilities. Physical activity and movement in children with and without Down syndrome is a critical facilitator of learning. As infants and children move they learn about the changing properties of their own systems (e.g., limb lengths, muscle strength, postural control) and their environment. Neural solutions to movement problems encountered must be discovered as the young child moves within his/her changing environment. Very limited research has been conducted on physical activity as it relates to learning of functional skills in children with and without Down syndrome. The common view based on parent and professional reports is that young children with Down syndrome are less active than their age peers without Down syndrome[75,76,77]. Based in part on these anecdotal reports, Henderson hypothesised that children with Down syndrome have "a self-perpetuating form of sensory-motor deprivation sparked off by an inbuilt passivity and disinclination to move" [75:p.74]. If this hypothesis is true, it would help to explain why infants and young children with Down syndrome experience significant delays in acquiring early movement skills. Limited research has been published to test this hypothesis. Ulrich and Ulrich compared the spontaneous leg movements of infants with Down syndrome and two groups of typically developing infants matched for chronological age and motor age. Their results suggest that the frequency of leg movements were not different between the three groups. These data suggest that poor motor skill development, over time, is more likely responsible for low levels of physical activity demonstrated later in life than is an inherent disposition toward inactivity. Early interventions that promote the development of efficient functional motor skills may, therefore, have a positive impact on multiple domains during infancy and may also create a solid foundation for future success in movement settings. In the Ulrich and Ulrich study, they did report that the infants with Down syndrome produced significantly fewer complex patterned leg movements in the form of kicks. In the three infant groups, infants who produced more kicks also walked earlier. The explanation provided for the relationship between kicking and age of walking relates to Edelman's model[71,78] which suggests that infants' self generated kicks belong to the same category of behaviors as the leg movements used to walk (hip, knee, and ankle flexions and extensions). The flexion and extensions used in walking are similar to what is seen in kicking. Given that the overall frequency of leg activity was not different between the three groups, it casts doubt on the inherent inactivity hypothesis. It is hypothesised that inactivity may be a learned or adaptive pattern of behavior that emerges with age. McKay and Angulo-Barroso conducted a longitudinal study of the spontaneous leg activity of infants with and without Down syndrome from three to six months of age. They placed an activity monitor on the right ankle of each infant for a period of 48 hours. Their findings suggest that infants with Down syndrome spend a greater duration of time throughout the day in low intensity leg activity. They also reported a significant relationship between low intensity leg movement and the age of onset of walking. The lower intensity activity might be attributable to the muscle properties and slowness of movement discussed in the first section of this paper. A small longitudinal intervention study was conducted to test if it was possible to increase kicking in 4-6 month old infants with Down syndrome and, if so, what the effects would be on age of walking onset. In this randomized study, infants with Down syndrome were given a Kick Start Gym (see Figure 4) or a Tummy Time Gym and the protocol required parents to place their infant under the device that employed a conjugate reinforcement system for 20 minutes five days each week for 12 weeks. In brief, the Kick Start Gym is designed to reinforce kicking in a supine posture and the Tummy Time Gym is designed to reinforce reaching in a prone posture. Each time the infant produced a kick that resulted in the foot touching the kick pad, a short burst of music and spinning toy resulted in reinforcing the kick. The frequency of kicks in both groups prior to the intervention was similar. Results following 12 weeks of the intervention demonstrated that the infants in the kicking group significantly increased their kicking compared to the reaching group. The kicking group also acquired the locomotor milestones earlier but did not reach statistical significance primarily due to inadequate statistical power. Future research is needed applying Edelman's model to early motor intervention and functional skill development. Effects of practice on motor coordination are not limited to early motor development. Several studies have documented rather dramatic changes in motor performance and in indices of motor coordination in persons with Down syndrome within a wide range from early adolescence to over 40 years of age[81-85]. Performance of young adults with Down syndrome shows dramatic improvement with practice even in tasks that are very simple and seem to offer little room for improvement. For example, when a person without Down syndrome is instructed to perform a very quick and accurate movement of a joint (e.g., the elbow) to a target, it takes only a few familiarisation trials to reach a performance level that remains virtually unchanged in the course of practice. In contrast, persons with Down syndrome show relatively poor performance in such tasks prior to practice. Their peak movement velocities are low, the trajectories show multiple velocity peaks, and muscles crossing the involved joint show irregular activation patterns, commonly with episodes of simultaneous activation of flexors and extensors. However, after only five days of practice, these movements become much faster (peak speed nearly doubles) with the emergence of a more typical pattern of muscle activation. A question emerges: Why did not those persons perform the movements with the typical patterns and characteristics at the onset of the study? The changed performance was likely due to adjustments at a neural level. One conclusion is that persons with Down syndrome have all the machinery, both muscular and neural, to perform movements with characteristics like those seen in persons without Down syndrome. Hence, their movement patterns that look clumsy and less efficient to an external observer are likely to reflect adaptive changes that have to be deciphered. Effects of practice on coordination have been notoriously hard to quantify, mostly because of the lack of an accepted quantitative index of coordination. Recently, a particular quantitative approach to motor synergies has been introduced that allows us to quantify patterns of coordination of muscles, joints, limbs, and fingers over a variety of tasks (reviewed in ref 88). This method was applied to analysis of multi-finger coordination in persons with Down syndrome who performed a task of accurate force production by pressing with the four fingers of the dominant hand on four force sensors[84,89]. Persons with Down syndrome showed patterns of finger force coordination that were dramatically different from those seen in subjects without Down syndrome. In a sense, persons with Down syndrome used their fingers as the prongs of a fork turned upside down pressing with all the fingers stronger or weaker and not using the flexibility of the hand design. After only three days of practice, persons with Down syndrome started to show more typical, flexible patterns of finger coordination such that an increase in the force of one finger could be accompanied by a decrease in the force of another finger. Participants in this study who were encouraged to perform various tasks during practice showed significantly larger improvements in their performance and indices of finger coordination as compared to those who practiced only the main task. In a recent study, effects of practice of treadmill walking were analysed in persons with and without Down syndrome. These persons produce patterns of locomotion that suggest atypically high values of the apparent joint stiffness in the lower extremities. Four sessions of practice have been shown to lead to changes in the stiffness indices towards more typical values observed in persons without Down syndrome. Overall, the cited studies suggest that practice can be a powerful tool for improving motor coordination in persons with Down syndrome over their lifetime, not only during the early stage of motor development. Individuals with Down syndrome are at higher risk for overweight and obesity than their typically developing peers. The prevalence of obesity in Down syndrome is estimated to be higher than in the typically developing populations, with many studies reporting a prevalence of overweight between 45% and 56%[90,91,92]. Research over the past 10 years has demonstrated the critical role played by physical activity in achieving and maintaining health in all children, youth, and adults, including those with disabilities[93,94,95]. The current guidelines recommend at least 30-60 minutes of moderate-intensity physical activity (MPA) on most days each week. Healthy People 2010 includes a section with the overall goal to "Improve health, fitness, and quality of life through daily physical activity"(see ref 96: Chapter 22). In this document, specific goals are set out, including: "to increase the proportion of adolescents who engage in vigorous-intensity physical activity (VPA) that promotes cardiorespiratory fitness three or more days per week for 20 or more minutes per occasion" (see ref 96, item 22-7) and "Increase the proportion of adolescents who engage in moderate physical activity for at least 30 minutes on 5 or more of the previous 7 days" (ref 96, item 22-6) and "Increase the proportion of trips made by walking" and "Increase the proportion of trips made by bicycling". A common characteristic shared by individuals with Down syndrome and other developmental disabilities is a stable pattern of physical inactivity[97-101]. Multiple reports describing the health related physical fitness of children, adolescents, and adults with Down syndrome consistently demonstrate that their physical fitness profiles are inferior to their typically developing age peers. Poorer fitness places them at higher risk for obesity, type II diabetes, coronary heart disease, early onset of ambulatory problems, difficulty maintaining their ability to work, and early morbidity[94,102,103,104]. As a result of these consistent findings, the United States Surgeon General convened an expert panel in 2001. This panel published proceedings that highlighted the critical problem of physical inactivity and obesity in people with intellectual disabilities. The panel recommended that major efforts be made to meaningfully increase the proportion of persons with intellectual disabilities participating in moderate levels of physical activity on a regular basis. Subsequent to the published proceedings, a few intervention studies have been reported in recent years. One study demonstrated success in improving cardiovascular fitness, muscular strength, and endurance in adults with Down syndrome participating in an exercise training program. This program was conducted in small groups, similar to programs available at a local health club. This study is very encouraging as it demonstrates that adults with Down syndrome can improve their fitness profile. Unfortunately, this study did not measure the physical activity level of the participants prior to, during, or following conclusion of the 12 week training program. There is no current empirical evidence that demonstrates that improvements in selected fitness parameters will lead to a significant increase in daily participation in physical activity at a moderate to vigorous intensity once the experimental exercise program concludes. The type of training study described above also assumes that persons with Down syndrome or their family can afford a membership to the health club. More studies are needed that specifically measure outcomes related to physical activity and do so, on a longitudinal basis. Physical activity levels in children with Down syndrome have not received much attention in the research literature. Overall time spent in moderate to vigorous physical activity (MVPA) as compared to typically developing peers has been documented through direct observation and accelerometry[101,106]. When compared to their typically developing siblings, children with Down syndrome spent less overall time in vigorous physical activity (VPA) and the bouts of VPA were also of shorter duration[101,107]. In a recent study, parents of children, teenagers, and young adults with Down syndrome (aged 3-22 years) participated in focus groups, and were asked questions related to their perceptions of the health and physical activity needs of their children. The parents of preschoolers with Down syndrome generally felt their children were physically active and that it was very important to them to keep them active to help prevent the onset of obesity they observe in older children with Down syndrome. Most of the parents of older children and teenagers with Down syndrome responded that their children were primarily physically active for social reasons. The presence of a sibling or peer was the prerequisite stimulus for the child with Down syndrome to engage in a physical activity. In the absence of a peer or sibling, sedentary activities dominated. Parents of the older children concluded that they wished someone would have convinced them earlier that it was extremely important for their child to learn an individual sport or activity (e.g., swimming, bicycling, bowling) because their child's skill level makes it difficult to engage in team sports that are competitive in nature. Recent medical research concludes that persons with Down syndrome have increased levels of oxidative stress and that oxidative damage has been hypothesised as a contributor to the neurologic, endocrine, and immunological problems, as well as the premature cell aging observed in this population. Obesity is also associated with increased oxidative stress. While some of the consequences of obesity, such as cardiovascular disease and diabetes, appear to be less common in Down syndrome than would be expected, given the high incidence of obesity in this population, other diseases associated with reactive oxygen species and higher levels of oxidative stress, such as Alzheimer's disease, are much more common in this population[111,112,113]. Interestingly, from a preventive health perspective, regular physical activity has recently been reported to improve erythrocyte antioxidant enzyme system in teenagers with Down syndrome. These researchers conclude that increasing physical activity may be valuable for individuals with Down syndrome beyond improving their health related physical fitness. Based on the conclusion that persons with Down syndrome become more inactive as they move through primary school, serious efforts must be made to reduce sedentary activity and increase time spent in moderate to vigorous physical activity most days each week. It is hypothesised that a major reason for the emerging, inactive lifestyle in children and young people with Down syndrome, is that most posses a very small repertoire of physical activities. We must find activities that are: valued by the child and the family; popular with siblings and peers; increasing community participation; promoting independence. We must also be innovative in conceiving and testing procedures to teach children the most critical activities. So, what physical activity can meet all of these criteria? One excellent option is riding a two wheel bicycle without training wheels. A recently completed randomized trial that was funded by the National Down Syndrome Society, was designed to test the effects of learning to ride a two wheel bicycle in 8-15 year old children with Down syndrome. We learned from a survey we conducted of parents in three large Down syndrome parent support organisations, who have a child in the 8-15 year old age range, that only 9.7% reported their child could ride a two wheel bicycle at least 9 metres (30 feet). We recruited 61 children and randomly assigned them to an experimental or control group. The experimental group received individualised bicycle training for 75 minutes each day for 5 consecutive days (total of 6 hours and 15 minutes). The control group did not receive the training until the second year of the study. All children participated in a series of measures prior to training, 60 days post training, and 12 months post training. The most exciting result was that 62% of the children (experimental and control groups) who received training, learned how to ride a two wheel bicycle a minimum of 9 metres within the 5 days of training. Needless to say the parents were thrilled. The other important result was that when we compared the experimental and control groups at the 12 month follow-up session, the experimental group displayed significantly less time in sedentary activity and significantly more time in moderate to vigorous activity compared to the control group that had not yet received their bicycle training. Parents have experienced great difficulty teaching their child with Down syndrome to ride a two wheel bicycle and as a result the child displays a high level of fear in riding that must be reduced if learning is to occur. We now have the procedures to teach most children to ride and anticipate important health and social outcomes. Research questions related to psychosocial benefits, community participation and increasing independence as a result of learning to ride a two wheel bicycle appear warranted. Livingstone B, Hirst P. Orthopedic disorders in school children with Down's syndrome with special reference to the incidence of joint laxity. Clinical Orthopedics. 1986;207:74-76. Haley SM. Sequence of development of postural reactions by infants with Down syndrome. Developmental Medicine and Child Neurology. 1987;29:674-679. Morris AF, Vaughan SE, Vaccaro P. Measurements of neuromuscular tone and strength in Down's syndrome children. Journal of Mental Deficiency Research. 1982;26:41-46. Spicer RL. Cardiovascular disease in Down syndrome. Pediatric Clinics of North America. 1984;31:1331-1343. Jobling A, Mon-Williams M. Motor development in Down syndrome: a longitudinal perspective. In: Weeks DJ, Chua R, Elliott D, editors. Perceptual-Motor Behavior in Down Syndrome. pp. Human Kinetics: Champaign, IL; 2000. p.199-223. Block ME. Motor development in children with Down syndrome: a review of the literature. Adapted Physical Activity Quarterly. 1991;8:179-209. Henderson SE. Motor skill development. In: Lane D, Stratford B, editors. Current approaches to Down syndrome. London: Cassell;1985. p. 187-218. McIntire MS, Menolascino FJ, Wiley JH. Mongolism - Some clinical aspects. American Journal on Mental Deficiency. 1965;69:749-800. Coleman M. Down's syndrome. Pediatrics Annals. 1978;7:36-63. Almeida GL, Marconi NF, Tortoza C, Ferreira SMS, Gottlieb GL, Corcos DM. Sensorimotor deficits in Down syndrome: Implications for facilitating motor performance. In: Weeks DJ, Chua R, Elliott D, editors. Perceptual-Motor Behavior in Down Syndrome. Human Kinetics: Champaign, IL;2000. p. 151-174. Lacquaniti F. Quantitative assessment of somatic muscle tone. Functional Neurology. 1990;5:209-215. Prechtl HFR. General movement assessment as a method of developmental neurology: new paradigms and their consequences. Developmental Medicine and Child Neurology. 2001;43:836-842. Anson JG. Neuromotor control and Down syndrome. In: Summers JJ, editor. Approaches to the Study of Motor Control and Learning. N-Holland: Amsterdam;1992. p. 387-412. Katz RT, Rymer WZ. Spastic hypertonia: mechanisms and measurement. Archives of Physical Medicine and Rehabilitation. 1989;70:144-155. Rarick GL, Dobbins DA, Broadhead GG. The Motor Domain and its Correlates in Educated Handicapped Children. Englewood Cliffs, N.J.: Prentice Hall;1976. Arndt, KH. Achillesehnenruptur and Sport. Leipzig. Johann Ambrosius Barth;1976. Borg TK, Caulfield JB. Morphology of connective tissue in skeletal muscle. Tissue and Cell. 1980;12;197-207. Ulrich BD, Ulrich DA. Dynamic systems approach to understanding motor delay in infants with Down Syndrome. In: Savelsbergh GJP, editor. The Development of Coordination in Infancy. Elsevier Science Publishers, Holland;1993. p.445-457. Spanò M, Mercuri E, Rando T, Panto T, Gagliano A, Henderson S, Guzzetta F. Motor and perceptual-motor competence in children with Down Syndrome. European Journal of Paediatric Neurology. 1999;3:7-14. Dietz V. Spastic movement disorder. Spinal Cord. 2000;38:389-393. Chan CWY, Kearney RE. Is the functional stretch reflex servo controlled or preprogramd? Electroencephalography and Clinical Neurophysiology. 1982;53:310-324. McKinley PA, Smith, JL, Gregor RJ. Responses of elbow extensors to landing forces during jump downs in cats. Experimental Brain Research. 1983;49:218-228. Levin MF, Feldman AG. The role of stretch reflex threshold regulation in normal and impaired motor control. Brain Research. 1994; 657:23-30. Jobin A, Levin MF. Regulation of stretch reflex threshold in elbow flexors in children with cerebral palsy: a new measure of spasticity. Developmental Medicine and Child Neurology. 2000;42:531-540. Hoffer JA, Andreassen S. Regulation of soleus muscle stiffness in premammillary cats: Intrinsic and reflex components. Journal of Neurophysiology. 1981;45:267-285. Proske U, Morgan DL. Tendon stiffness: methods of measurement and significance for the control of movement. A review. Journal of Biomechanics. 1987;20:75-82. Zajac, FE. Muscle and tendon: Properties, models, scaling, and application to biomechanics and motor control. CRC Critical Reviews in Biomedical Engineering. 1989;17:359-411. Feldman, AG. Once more on the equilibrium-point hypothesis ( model) for motor control. Journal of Motor Behavior. 1986;18:17-54. Shumway-Cook A, Woollacott MH (1985). Dynamics of postural control in the child with Down Syndrome. Physical Therapy. 1985;65:1315-1322. Aruin AS, Almeida GL. A coactivation strategy in anticipatory postural adjustments in persons with Down syndrome. Motor Control. 1996;1:178-191. Aruin AS, Almeida GL, Latash ML. Organization of a simple two-joint synergy in individuals with Down syndrome. American Journal of Mental Retardation. 1996;101:256-268. Latash ML, Almeida GL, Corcos DM. Pre-programd reactions in individuals with Down syndrome: The effects of instruction and predictability of the perturbation. Archives of Physical Medicine and Rehabilitation. 1993;73:391-399. Latash ML, Gottlieb GL. Compliant characteristics of single joints: Preservation of equifinality with phasic reactions. Biological Cybernetics. 1990;62:331-336. Sanger TD. Pathophysiology of pediatric movement disorders. Journal of Child Neurology. 2003;18:S9-24. Pandyan AD, Price CIM, Barnes MP, Johnson GR. A biomechanical investigation into the validity of the modified Ashworth Scale as a measure of elbow spasticity. Clinical Rehabilitation. 2003;17:290-294. Hunter IW, Kearney RE. Dynamics of human ankle stiffness: variation with mean ankle torque Journal of Biomechanics. 1982;15:747-752. Lambertz D, Mora I, Grosset J-F, Pérot C. Evaluation of musculotendinous stiffness in prepubertal children and adults, taking into account muscle activity. Journal of Applied Physiology. 2003;95:64-72. Stefanyshyn DJ, Nigg BM. Dynamic angular stiffness of the ankle joint during running and sprinting. Journal of Applied Biomechanics. 1998;14:292-299. Lamontagne A, Malouin F, Richards CL. Viscoelastic behavior of plantar flexor muscle-tendon unit at rest. Journal of Orthopaedic and Sports Physical Therapy. 1997;26:244-252. Magnusson SP. Passive properties of human skeletal muscle during stretch maneuvers. A review. Scandinavian Journal of Medicine and Science in Sports. 1998; 8:65-77. Pandyan AD, Price CIM, Rodgers H, Barnes MP, Johnson GR. Biomechanical examination of a commonly used measure of spasticity. Clinical Biomechanics. 2001;16:859-865. Loram ID, Maganaris CN, Lakie M. Use of ultrasound to make noninvasive in vivo measurement of continuous changes in human muscle contractile length. Journal of Applied Physiology. 2006;100:1311-1323. Juul-Kristensen B, Bojsen-Møller F, Holst E, Ekdahl C. Comparison of muscle sizes and moment arms of two rotator cuff muscles measured by ultrasonography and magnetic resonance imaging. European Journal of Ultrasound. 2000;11:161-173. Bobath B. Abnormal postural reflex activity caused by brain lesions (2nd ed). London: Heinemann;1971. Bojsen-Møller J, Magnusson S.P, Rasmussen LR, Kjaer M, Aagaard P. Muscle performance during maximal isometric and dynamic contractions is influenced by the stiffness of the tendinous structures. Journal of Applied Physiology. 2005;99:986-994. Finni T, Hodgson JA, Lai A.M, Edgerton V.R, Sinha S. Nonuniform strain of human soleus aponeurosis-tendon complex during submaximal voluntary contractions in vivo. Journal of Applied Physiology. 2003;95:829-837. Sutherland DH, Olshen R, Cooper L, Woo SLY. The development of mature gait. The Journal of Bone and Joint Surgery. 1980;62:336-353. Rast MM, Harris SR. Motor control in infants with Down syndrome. Developmental Medicine and Child Neurology. 1985;27:675-685. Ulrich BD, Ulrich DA. Spontaneous leg movement of infants with Down syndrome and nondisabled infants. Child Development. 1995;66:1844-1855. Pang MYC, Yang JF. The initiation of the swing phase in human infant stepping: importance of hip position and leg loading. Journal of Physiology. 2000;528:389-404. Cioni M, Cocilovo A, Rossi F, Paci D, Valle MS. Analysis of ankle kinetics during walking in individuals with Down syndrome. American Journal on Mental Retardation. 2001;106:470-478. Whittle MW. Gait analysis: an introduction (2nd ed). Butterworth-Heinemann, Oxford, UK;1996. Ganley KJ, Powers CM. Gait kinematics and kinetics of 7-year-old children: a comparison to adults using age-specific anthropometric data. Gait and Posture. 2005;21:141-145. Harris SR, Heriza CB. Measuring infant movement: Clinical and technological assessment technique. Physical Therapy. 1987;67:1877-1880. Berthenthal BI, Campos JJ. A systems approach to the organizing effects of self-produced locomotion during infancy. In: Rovee-Collier C, Lipsitt LP, editors. Advances in infancy research. Norwood, NJ: Ablex;1990. Vol. 6, p. 1-60. Berthenthal BI, Campos JJ, Barrett KC. Self-produced locomotion: An organizer of emotional, cognitive, and social development in infancy. In: Emde RN, Harmon RJ, editors. Continuity and discontinuities in development. New York: Plenum;1984. p. 175-209. Campos JJ, Bertenthal BI. Locomotion and psychological development in infancy. In: Morrison F, Lord C, Keating D, editors. Applied Developmental Psychology (Vol. 3). New York: Academic;1991. Campos JJ, Anderson DI, Barbu-Roth MA, Hubbard EM, Hertenstein MJ, Witherington D. Travel broadens the mind. Infancy. 2000;1:149-219. Kermoian R, Campos JJ. Locomotor experience: A facilitator of spatial cognitive development. Child Development. 1988;59:908-917. Rosenbloom L. The contribution of motor behavior to child development. Physiotherapy. 1971;57:159-162. Mahler M, Pine F, Bergman A. The psychological birth of the human infant. New York: Basic Books;1975. Spitz R. The first year of life. New York: International Universities Press;1975. Ulrich DA, Ulrich BD, Angulo-Kinzler R, Yun JK. Treadmill training of infants with Down syndrome: Evidence-based developmental outcomes. Pediatrics. 2001;108:84-91. Jones D, Liggon C, Biringen Z. Elation after walking onset: Does mother notice? Paper presented at the biennial meeting of the Society for Research in Child Development, Seattle. 1991, April. Sloper P, Knussen C, Turner S, Cunningham C. Factors related to stress and satisfaction with life in families of children with Down's syndrome. Journal of Child Psychology and Psychiatry. 1991;32:655-676. Virji-Babul N, Brown M. Stepping over obstacles: anticipatory modifications in children with and without Down syndrome. Experimental Brain Research. 2004;159:487-490. Latash ML. Motor coordination in Down syndrome: The role of adaptive changes. In: Weeks DJ, Chua R, Elliott D, editors. Perceptual-Motor Behavior in Down Syndrome. Human Kinetics: Champaign, IL;2000. p.199-223. Ulrich DA, Lloyd MC, Tiernan CW, Looper JE, Angulo-Barroso RM. Effects of intensity of treadmill training on developmental outcomes in infants with Down syndrome: a randomized trial. Physical Therapy. 2008;88(1):114-22. Edelman, G. Neural Darwinism: The theory of neuronal group selection. New York: Basic Books;1987. Hadders-Algra M. The neuronal group selection theory: A framework to explain variation in normal motor development. Developmental Medicine and Child Neurology. 2000;42: 566-572. Kamm K, Thelen E, Jensen JL. A dynamical systems approach to motor development. Physical Therapy. 1990;70:763-775. Thelen E, Smith LB. A Dynamic Systems Approach to the Development of Cognition and Action. Cambridge, MA: MIT Press;1994. McKay SM, Angulo-Barroso RM. Longitudinal assessment of leg motor activity and sleep patterns in infants with and without Down syndrome. Infant Behavior and Development. 2006;29:153-169. Sharav T, Bowman T. Dietary practices, physical activity, and body mass index in a selected population of Down syndrome children and their siblings. Clinical Pediatrics. 1992;33:341-344. Sporns O, Edelman GM. Solving Bernstein's problem: a proposal for the development of coordinated movement by selection. Child Development. 1993;64:960-981. Lloyd MC, Ulrich DA. 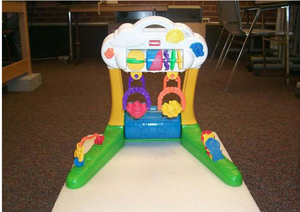 The use of the Kick and Drive Gym to increase kicking in infants with Down syndrome. Journal of Sport and Exercise Psychology. 2006;28:Supplement, S28, 121. Rovee CK, Rovee DT. Conjugate reinforcement of infant exploratory behavior. Experimental Child Psychology. 1969;8:33-39. Kerr R, Blais C. Motor skill acquisition by individuals with Down Syndrome. American Journal on Mental Deficiency. 1985;90:313-318. Edwards JM, Elliott D. Asymmetries in intermanual transfer of training and motor overflow in adults with Down's syndrome and nonhandicapped children. Journal of Clinical and Experimental Neuropsychology. 1989;11:959-966. Almeida GL, Corcos DM, Latash ML. Practice and transfer effects during fast single joint elbow movements in individuals with Down syndrome. Physical Therapy. 1994;74:1000-1016. Latash ML, Kang N, Patterson D. Finger coordination in persons with Down syndrome: Atypical patterns of coordination and the effects of practice. Experimental Brain Research. 2002;146: 345-355. Smith BA, Kubo M, Black DP, Holt KG, Ulrich BD. Effect of practice of a novel task - walking on a treadmill: Preadolescents with and without Down syndrome. Physical Therapy. 2007;87:766-777. Latash ML, Corcos DM. Kinematic and electromyographic characteristics of single-joint movements of individuals with Down Syndrome. American Journal of Mental Retardation. 1991;96:189-201. Latash ML, Anson JG. What are normal movements in atypical populations? Behavioral and Brain Sciences. 1996;19:55-106. Latash ML, Scholz JP, Schöner G. Toward a new theory of motor synergies. Motor Control. 2007;11:275-307. Scholz JP, Kang N, Patterson D, Latash ML. Uncontrolled manifold analysis of single trials during multi-finger force production by persons with and without Down syndrome. Experimental Brain Research. 2003;153:45-58. Chumlea W, Cronk CE. Overweight among children with Trisomy 21. Journal of Mental Deficiency Research. 1981;25:275-280. Luke A, Sutton M, Schoeller DA, Roizen NJM. Nutrient intake and obesity in prepubescent children with Down syndrome. Journal of the American Dietetic Association. 1996;96(12):1262-1267. Rubin SS, Rimmer, JH, Chicoine B, Braddock, D, McGuire, DE. Overweight prevalence in persons with Down syndrome. Mental Retardation. 1998;36:175-181. Ekblom B, Astrand P-O. Role of physical activity on health in children and adolescents. Acta Paediatrica. 2000;89:762-764. Rimmer JH, Heller T, Wang E, Valerio I. Improvements in physical fitness in adults with Down syndrome. American Journal of Mental Retardation. 2004;109:165-74. Rimmer JH, Yamaki K. Obesity and intellectual disability. Mental Retardation and Developmental Disability Research Reviews. 2006;12(1):22-7. Draheim CC, Williams DP, McCubbin JA. Prevalence of physical inactivity and recommended physical activity in community- based adults with mental retardation. Mental Retardation. 2002;40:436-444. Rimmer JH, Braddock D, Pitetti K. Research on physical activity and disability: an emerging national priority. Medicine and Science in Sports and Exercise. 1996;28(11):366-72. Pan CY, Frey GC. Identifying physical activity determinants in youth with autism spectrum disorders. Research Quarterly for Exercise and Sport. 2005;76(1):A116-A117. Pan CY, Frey GC. Physical activity patterns in youth with autism spectrum disorders. Journal of Autism And Developmental Disorders. 2006;36(5):597-606. Whitt-Glover MC, O'Neill KL, Stettler N. Physical activity patterns in children with and without Down syndrome. Pediatric Rehabilitation. 2006;9(2):158-164. Pitetti, KH, Rimmer, JH, Fernhall B. Physical fitness and adults with mental retardation. An overview of current research and future directions. Sports Medicine. 1993;16(1):23-56. Fernhall B, Pitetti KH, Rimmer JH, McCubbin JA, Rintala P, Miller AL, Kittredge J, Burkett LN. Cardiorespiratory capacity of individuals with mental retardation including Down syndrome. Medicine and Science in Sports and Exercise. 1996; 28(3):366-71. Fernhall B, McCubbin JA, Pitetti KH, Rintala P, Rimmer JH, Millar AL, De Silva A. Prediction of maximal heart rate in individuals with mental retardation. Medicine and Science in Sports and Exercise. 2001;33(10):1655-60. Faison-Hodge, Porretta DL. Physical activity levels of students with mental retardation and students without disabilities. Research Quarterly for Exercise and Sport. 2002;73(1):A103-A103. Carratelli M, Porcaro L, Ruscica M, De Simone E, Bertelli AA, Corsi MM. Reactive oxygen metabolites and prooxidant status in children with Down's syndrome. International Journal of Clinical Pharmacology Research. 2001;21(2):79-84. Pastore A, Tozzi G, Gaeta LM, Giannotti A, Bertini E, Federici G, Digilio MR, Piemonte F. Glutathione metabolism and antioxidant enzymes in children with Down syndrome. Journal of Pediatrics. 2003;142(5):583-585. Mohn A, Catino M, Capanna R, Giannini C, Marcovecchio M, Chiarelli F. Increased oxidative stress in prepubertal severely obese children: Effect of a dietary restriction-weight loss program. Journal of Clinical Endocrinology and Metabolism. 2005;90(5):2653-2658. Arbuzova ST, Hutchin T, Cuckle H. Mitochondrial dysfunction and Down's syndrome. Bioessays. 2002;24(8):681-4. Ho PC, Nguyen M. Acute two-vessel coronary closure in a patient with Down's syndrome. International Journal of Cardiovascular Intervention. 2003;5(2):95-7. Braunschweig CL, Gomez S, Sheean P, Tomey KM, Rimmer J, Heller T. Nutritional status and risk factors for chronic disease in urban-dwelling adults with Down syndrome. American Journal on Mental Retardation. 2004;109(2):186-93. Ordonez FJ, Rosety M, Rosety-Rodriguez M. Regular physical activity increases glutathione peroxidase activity in adolescents with Down syndrome. Clinical Journal Of Sport Medicine. 2006;16(4):355-356. Ulrich DA, Burghardt A, Lloyd MC, Tiernan CW, Hornyak J. Effects of a bicycle training program on physical activity patterns in youth with Down syndrome: a randomized trial. Manuscript submitted for review in Pediatrics;2008.